For Iranian-Americans, A Minefield Members of the Iranian-American community maintain contacts with friends and family in Iran. But that means negotiating the confusing array of sanctions the U.S. government has imposed on Iran for more than three decades. One recent legal case highlights the issue. 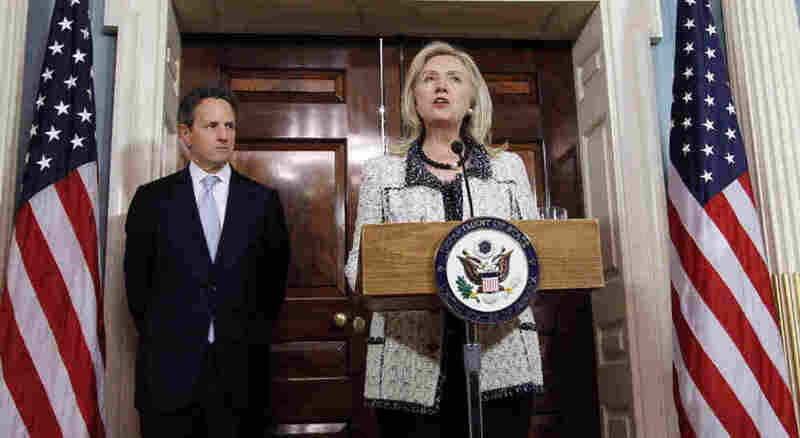 Secretary of State Hillary Clinton speaks while Treasury Secretary Tim Geithner looks on during a Nov. 21 news conference about new sanctions against Iran. At the beginning of last year, Mahmoud Reza Banki's future looked bright. He was a senior associate at the prestigious consulting firm McKinsey and Co., and had been accepted to the Wharton School of Business at the University of Pennsylvania. But Banki, 35, was arrested in January 2010 and charged with accepting large money transfers from Iran that violated U.S. sanctions against that country. From May 2006 to September 2009, his family in Iran deposited almost $3.4 million into his U.S. bank account through 56 deposits. The money was for personal use, including the purchase of a $2.4 million apartment in New York City. Banki reported receiving the money on his tax returns, but was convicted of illegally operating an informal money transfer network, known as hawala, and for violating sanctions against Iran. He was sentenced to 30 months in a case that raised alarm and sowed confusion in the Iranian-American community as they tried to figure out what is and isn't permitted under U.S. sanctions laws. Right now, it's any goods of Iranian origin that can't be imported. Things as benign as rugs or artisan goods created in Iran. Even things your family gives you. The U.S. has imposed punitive measures against Iran since shortly after the 1979 Iranian revolution, and Secretary of State Hillary Clinton announced additional sanctions on Nov. 21. The laws have become tougher in recent years as the U.S. government seeks to squeeze Iran economically. However, the measures can make life extremely complicated for Iranian-Americans who live in this country but maintain contact with family and friends in Iran. Just sending or receiving a small amount of money or other items can violate the law. There are many forms of hawala, and a typical case might involve a U.S. citizen of Iranian descent who wishes to send $1,000 to a family member or friend in Iran. The U.S. citizen would give $1,000 to a hawala broker in the U.S. The broker then contacts a hawala broker in Iran, who gives the $1,000 to the intended recipient. Eventually, the Iranian broker will find a client who wishes to send money to the U.S. so that debts are cleared between the two brokers. Banki was born in Iran but became a naturalized U.S. citizen after he moved to the U.S. at age 18 to attend college. He eventually received a doctorate in chemical engineering from Princeton. Most of his family members remained in Iran, where they own three power companies and a pharmaceutical company. His family sent him the money, and Banki said he believed he was following the law by reporting it on his taxes. However, prosecutors disagreed. Banki challenged his conviction by arguing that the court had failed to give the jury proper instructions. An appeals court eventually agreed and threw out the conviction after Banki had served 21 months of the 30-month sentence. A judge ordered Banki released from a federal prison in California on Nov. 2. August 2011: JPMorgan Chase & Co. paid $88.3 million to settle violations for engaging in financial transactions with Iran and other countries. April 2011: Aegis Electronic Group Inc. agreed to pay $20,000 to settle allegations of violations of sanctions for allegedly exporting two camera control units from the U.S. to Austria with knowledge that the items were intended for re-export to Iran. 2009: DHL paid $9.4 million over allegedly improper shipments to Iran and Sudan in violation of sanctions programs. 2003: Varian Inc. paid more than $100,000 to settle allegations that it violated the Iranian sanctions between March 2001 and October 2003 by exporting U.S.-origin software. The court ruled that the sanctions laws do allow for noncommercial family transfers. Still, the U.S. Department of the Treasury has put out guidance on the Iranian sanctions and says such transactions should be carried out through "intermediary third-country banks." Bitta Mostofi, an Iranian-American activist and lawyer who has lobbied extensively against U.S. sanctions against Iraq, is opposed to the latest round of sanctions on Iran. She says it hurts Iranian-Americans, and to an even greater degree it hits poor and middle-class Iranians. "The [Iranian] elite becomes more and more powerful and can function in black markets," Mostofi says. "I have friends whose parents and siblings lost jobs because they were importing or exporting goods." Erich Ferrari, a private lawyer specializing in financial regulations, says he believes the sanctions are having their intended effect and are creating a strain on the Iranian economy. However, it's been decades since the U.S. began imposing sanctions against Iran, and, as he notes, "the Islamic Republic is still surviving." Ferrari, who recently published a 234-page book on how to navigate the Iranian sanctions, says he has received many calls since Banki's case, which received widespread attention in the Iranian-American community. Ferrari says he has six clients who were charged with receiving money from Iran in violation of sanctions. However, three of the cases have since been dropped, he says. According to lawyers involved in these cases, many Iranian-Americans don't have a good grasp of the sanctions laws. For instance, says Mostofi, the Iranian-American lawyer, the current law bans the import of any goods of Iranian origin. And that, she says, includes "things as benign as rugs or artisan goods created in Iran, even things your family gives you." Babak Hoghooghi, an attorney in Washington, D.C., says he has multiple clients who have received subpoenas from the Treasury Department's Office of Foreign Assets Control. The FBI and the Department of Justice also seem to be taking more interest in these cases, he says. After years of sanctions, the question of inheritance is increasingly an issue, says Hoghooghi. When Iranian parents die and want to pass on their estates to children who live in the U.S., he says, "it is very difficult to transfer money to official, financial formal institutions, so a lot of them resort to money exchangers."